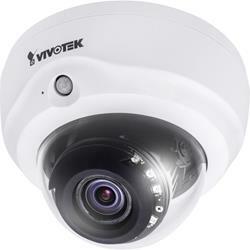 VIVOTEK's FD816BA-H is a series of indoor dome network cameras equipped with a Full HD sensor enabling viewing resolution of 1920x1080 at 30 fps. Featuring VIVOTEK's WDR and SNV technology, the series is capable of capturing high quality and high visibility video whether in high contrast or low light environments. For indoor applications, VIVOTEK's FD816BA-H series is armed with a built-in PIR sensor to help detect unexpected events and provide security in real time. When selecting the VIVOTEK FD816BA-H series, users have two options: the FD816BA-HF2 and the FD816BA-HT. Choosing the appropriate model will ensure any focusing requirements can be met.